While on a three-day visit to Egypt that ended yesterday evening, and during which he met President Abdel-Fattah al-Sisi, French President Emmanuel Macron was received by Pope Tawadros II at St Mark’s Cathedral in Abbassiya, Cairo, on 29 January. 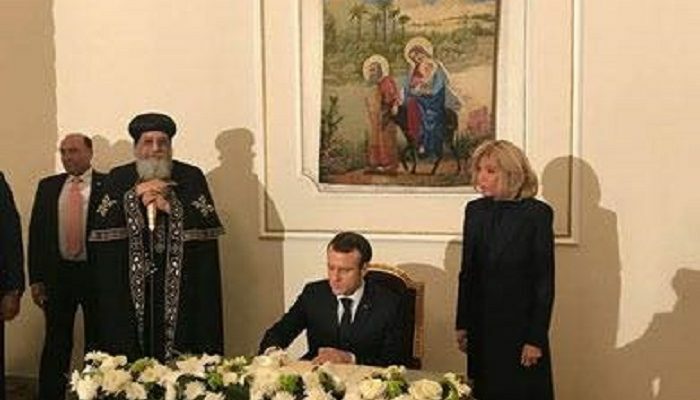 “Being here today reflects how we the French people respect the Coptic Orthodox Church and what it represents not only in the history of Egypt but also in the future of the country,” President Macron said. Discussions between President Macron and Pope Tawadros focused on education as the key to build a productive and advanced society. 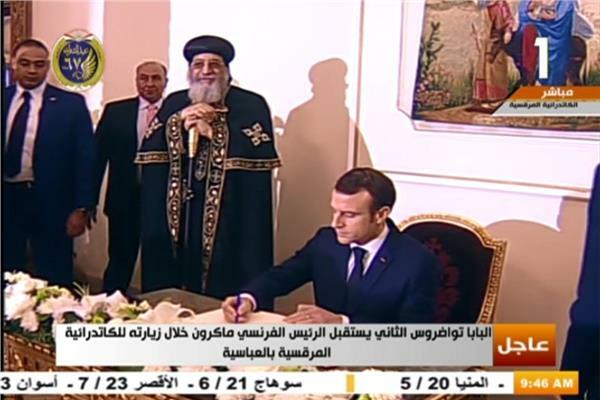 In a televised press conference in the Cathedral, Pope Tawadros told Macron that stability, peace, and national unity can only be achieved and maintained through dialogue. He said that, in Egypt, such dialogue is ongoing through a number of Islamic and Coptic institutions. The President and Pope agreed that education in the current period was vitally important, with President Macron insisting it was a foremost battle in which his country wished to support Egypt. 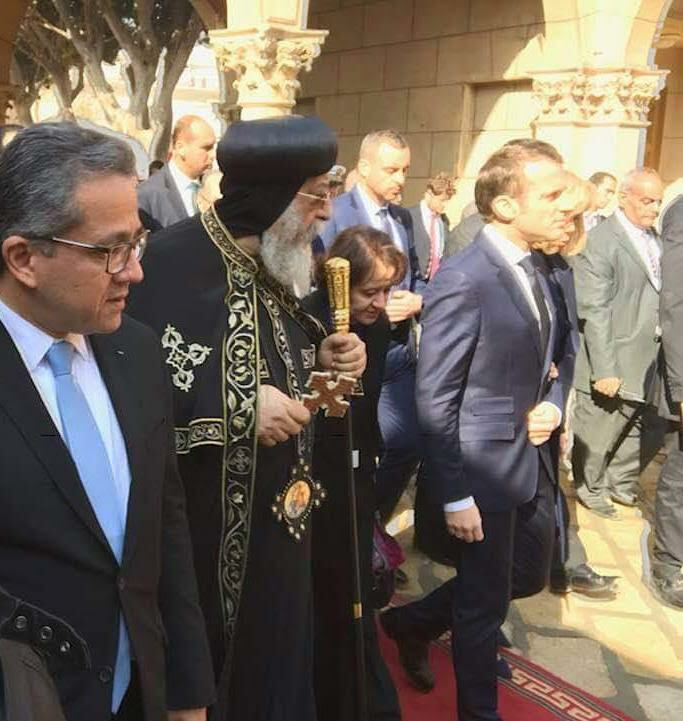 Pope Tawadros accompanied President Macron and his wife on a tour in the newly renovated Cathedral which in 2018 celebrated 50 years on its opening. They listened to a detailed explanation of the elements of the Cathedral, the icons, and the stained-glass artworks. The Pope then led President and Mrs Macron to the adjacent al-Boutrossiya Church which was the scene of a suicide bombing during Sunday Mass on 11 December 2016. The bombing killed 29 Copts, injured some 50 worshippers, and left the church in ruins. The Egyptian Armed Forces restored the church which has since January 2017 been open for worship, and which today includes a shrine for the martyrs. President Macron placed a bouquet of white flowers in the shrine. The Cathedral visit was followed by one to the Sheikhdom of al-Azhar—al-Azhar is the topmost authority in the world on Sunni Islam—where President Macron met the Grand Imam of al-Azhar, Sheikh Ahmad al-Tayyeb. Their talks centred on “the training of imams (prayer leaders) in France and the fight against the misguided vision of religion”, the French presidency said. President Macron had flown to Egypt on Sunday 27 January, landing at the southern city of Aswan. He visited the temple of Abu-Simbel and toured a number of ancient Egyptian monuments including, when he arrived at Cairo, the Giza Pyramids and Saladin Citadel. The delegation accompanying the French President included government ministers as well as some two dozen representatives of academic, cultural, and scientific institutions, and a dozen business leaders, among them top officials of Rafale producer Dassault. On 28 January, President Macron met President Abdel-Fattah al-Sisi in Cairo. Their talks focused on strengthening the strategic partnership between Egypt and France, tackling also the issue of human rights. The French President said that respect of freedoms was inseparable from stability and durable peace, whereas President Sisi said that security was the priority for Egypt’s 100-million population. “Egypt does not advance through bloggers. It advances through the work, effort and perseverance of her sons,” he said. During the visit, the two presidents oversaw the signing of some 30 deals worth nearly a billion euros in the fields of transportation, education, economics, telecommunication, renewable energy, industry, and health. No arm deals were signed. A number of memoranda of understanding were also signed on cultural activities. 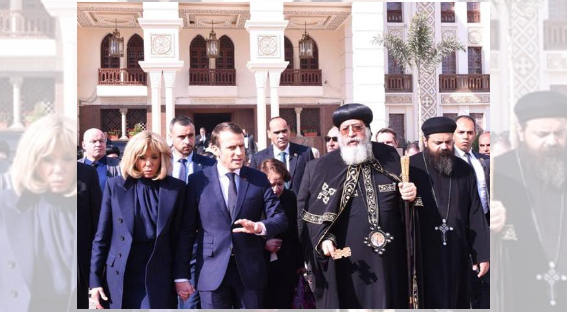 President Macron, together with President Sisi, visited the Cathedral of the Nativity of Christ and the neighbouring Mosque of al-Fattah al-Aleem in Egypt’s new capital currently under construction some 40km northeast Cairo. The two places of worship are considered the biggest in Egypt and the Middle East, and were simultaneously opened by President Sisi on the evening of 6 January 2019; the date coincided with Coptic Christmas Eve.